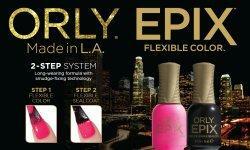 Orly EPIX is a 2 step system with long wearing formula and smudge-fixing technology. No base coat or UV light needed. Dries faster and delivers a high shine finish. Applies easily and removes like a polish.